We love the look of a simple, stamped monogram pendant on top of a vibrant enameled blank. We used a chasing hammer to make the edges on the circle blanks look extra special. 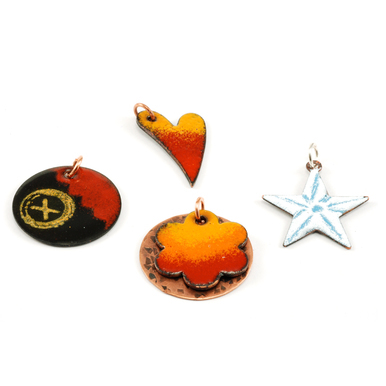 This project is a great way to get into enameling. 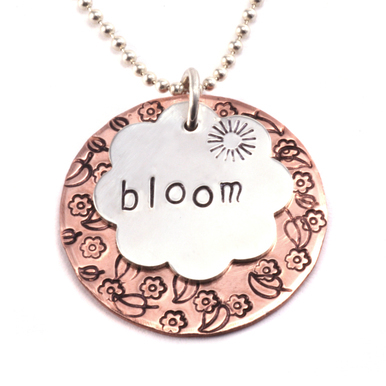 We have free, online classes on both stamping and enameling, so you can watch and make at your leisure! Screw Down Hole Punch, 1.6mm & 2.3mm holes - $33.32 - It's important to punch a hole large enough so the enamel does not close the hole up. Typewriter Uppercase Letter Stamp Set 1/8" (3.2mm) - $44.00 - We used the letter "M" from this set. Script Monogram Uppercase Letter Stamp Set (8mm) - $254.00 - We used the letter "R" from this set. Monogram Letter "R" 6mm - $8.95 - Individual monogram stamps are a great option if you only need a couple letters. Fretz Chasing Hammer - $57.00 - we used the rounded side to finish the edge of the stamped circle blanks. Sterling Silver Round, Disc, Circle, 9.5mm (.37"), 24g - $1.33 - Letter "M". Copper Round, Disc, Circle, 12.7mm (.50"), 24g - $0.65 - Yellow enamel. Sterling Silver Round, Disc, Circle, 12.7mm (.50"), 24g - $1.43 - Letter "R". I love this project! I make the pendants for my friends as gifts and they love them. I get a lot of compliments when I wear mine as well.